It’s incredible to think the final round of the Pro Tour has arrived already, and the nine rounds that have passed have each been great experiences in their own way. 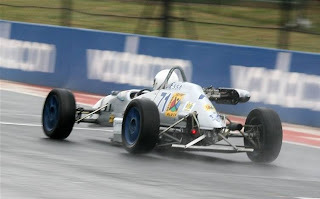 The 10th round at Kyalami was to be no different. 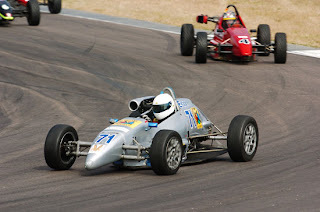 The 1st race was quite boring as far as Formula Vee standards go! I was on my own most of the time, trying to keep touch with the leading bunch. Unfortunately it seemed that some damage to my front tyre (sustained at the crash at the previous round) had really started to affect the handling of the car. The understeer got increasingly worse, but I managed to come over the line for 4th place. We managed to get a replacement tyre for the 2nd race, which turned out to be completely wet! After running the sighting lap before the race start, it seemed the track was pretty wet; wet enough I thought for a gamble to try start in 2nd gear. The 2nd gear ratio is very short in a Vee, and I think it would have worked out had I practiced such a thing before! It turned out to be a complete disaster, with me stalling the engine about five metres into the race. Luckily I was rolling enough to ease the clutch out, but by that time I was basically in last position. But from there I had one of my best races! Everyone seemed really cautious on the slippery track, and I was passing cars very quickly. I took no risks on the brakes, as it was very easy to lock the wheels and fly straight off the track, but I was pushing hard in the corners trying to find the grippiest part of the track. It was scary at times, but it worked out great. I worked my way back up to 3rd, with the leaders way too far in front to catch. I merely maintained position for the last 3 or 4 laps in very tricky conditions, but it seemed I was lapping slightly quicker than the leaders at that point! It would have been interesting had I not stalled at the start, but the race would not have been that fun coming back through the field! All in all, the year has been a great success, finishing 6th in the championship, and consistently challenging for podiums in the final few races. I have learned an incredible amount this year, maybe even more than last year when I first started out. To try and challenge in the top 5, let alone podiums, is extremely difficult. I am thankful for being in such a great team to provide me with that opportunity though, with a wealth of experience and knowledge to help both me and my teammate to push further up the grid. 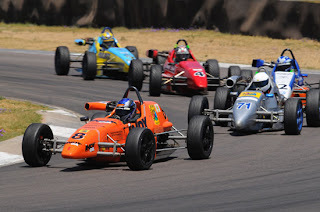 The penultimate round of the Pro Tour was held at Zwartkops, coming from a very eventful and successful Phakisa race. I was hoping for a similar performance, and it certainly looked very close at the top of the field during the practice sessions. I was trying yet again to find a way around the understeer, and could just about come up with a decent setup, although I lost a lot of time in the slow corners. After qualifying 5th, only 0.1sec behind P2, it was definitely going to be a tight race. The 1st heat was very eventful, and I found myself in 3rd position most of the race behind my teammate, and fending off the challenges from behind from other drivers. The entire race was packed with incidents, and there were yellow flags on just about every lap. On about lap 8 of 12, the safety car was deployed, but the boards were not made immediately visible to the drivers. Most of the front running pack did not see anything, and I was one of them. My teammate must have seen the SC board late, and braked really hard. Unfortunately I was directly behind him at this point, with no chance of avoiding an accident. This unlucky moment ended up with both development drivers out the race, after running in potential podium positions all race! 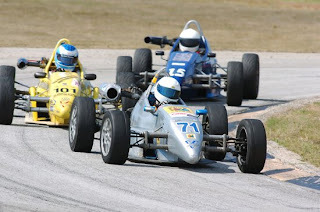 Both cars were repaired for the 2nd heat, and we had to start from the back of the grid. It was fun getting through the pack as fast as possible, but I was caught up with a very aggressive midfield battle which took too long to clear. I ended up coming out in 6th position, with 5th place too far up the road to catch in the remaining laps. I’m definitely happy with the improvement of performance over the last few races, although this particular race ended up with a very unfortunate incident. The last round should be quite a nice challenge at Kyalami, with the top 5 drivers being extremely competitive! I’m looking forward to it. The 6th round of the Pro Tour was held at the extremely fast East London GP circuit, and it is great fun in a Vee! I had reasonable success last year, and was looking forward to this race after some modifications were done to improve my handling. After a couple of practice sessions however, I was struggling with the balance in the infield section, and eventually had to settle for a car that gave some nasty snap oversteer out of corners. We were trying several settings with the engine and carburetors to get it to perform like the front runners, but I still struggled a little bit. Qualifying went okay, as I was working with my teammate to get a good slipstream down the straight. 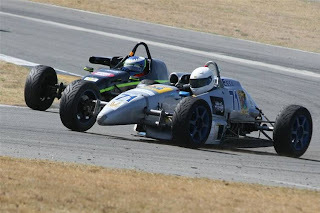 However, we never took full advantage of this through the rest of the lap, and my laptime did not turn out that great. Starting from 8th, the first race was really a great battle. I was in a pack of 4, and it was tight racing. I was trying my hardest to stay fast through the infield somehow without spinning, and it was an interesting and strategic race. I missed the final lap board, and therefore was not aggressive enough to attack for 5th place, which left me in only 8th after all that work. The 2nd race was less exciting, but I was more comfortable with the car. 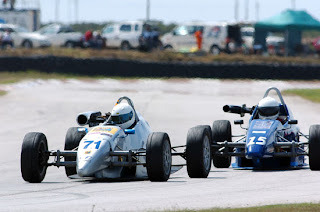 I was again involved in a 4-car fight, except I lost the slipstream crucially when the speed rocket of Johan Gouws’ car pulled Symm Grobler and Peter Hills away from me when I couldn’t take advantage in the infield again. It took a lot of laps and hard work to haul them back in without slipstream, and I finally got back in the mix on the final lap. Every corner was quite an aggressive fight, and I managed to at least recover one position to 8th. Throughout the sessions I was struggling with some pretty chronic understeer, I lost an insane amount of time in the slow corners on the circuit, probably 95% of the laptime lost to the front guys. We set the car up for as much oversteer we possibly could, and still I got understeer. Dean reckons it could be my front shocks that are giving up, but he is going to work on some other things for the next race...for now I had to just live with it. I qualified 5th, and really thought I could do a little better. I was battling with the overall grip from the tyres, they only really got enough heat after a few laps of running. I think just about everyone in the top10 were running new tyres as well....the race was going to be tough. Race 1 was highly boring. I changed some things with tyre pressure to try get more heat, but the balance was all off and that was quite surprising. 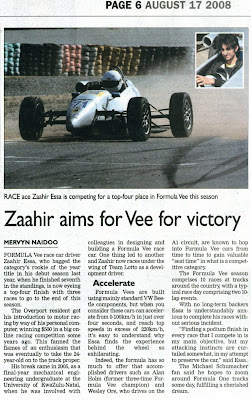 Race 2 was much better after I rectified the pressures, and was running just behind the battle for 3rd/4th place. I'm really not using simracing to its full capacity to help with my Formula Vee racing....maybe a couple years ago. I just race in a local league for fun, without much preparation. The races are not the same as the other leagues I've driven, I don't get pushed and put under pressure, there is nobody I have to chase and do 100laps to find an extra 0.05sec. There isn't that urgency or sustained period of time on the limit. My mental game has dropped significantly, and I really need to get back into things, back into the crazy leagues. The main reason for this is of course my PC performance, which prevents me from even practicing with the big guns, but I'm slowly trying to get the thing up to a decent spec so that I can push 100% of the time, and increase the limits of an on-the-limit lap. My mental racing peak was 2years ago without a doubt, I definitely feel much weaker. Simracing is for 'free', and I know it can help more. 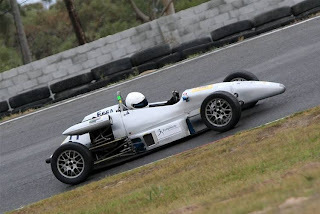 I really want to do well at Zwartkops. But this is what I hope for every race. What needs to change? My mental game needs to be supermassive going into this. Something huge that will warrant a change. My engine is being rebuilt, and cylinder head replaced, so I'll see how that performs. Either way, whatever state that car is in, I need to push that thing like never before. Not that I havn't been on the limit already, but it needs to be more. The transition might take a few races, but the limit I am at is hopeless. The next level awaits....I have set my goal by the end of the year! New tyres were great! Thanks to Symplexity again, the car really felt like a new beast. I could brake so much later (and steadier) than before, and just chuck the car into the corners. I struggled quite a bit with understeer in the slow stuff though, it was costing me a lot of time. Eventually I settled on a decent setup, but still was losing so much time in the slow corners. I felt it was okay since with that balance I was pretty strong in the fast stuff. It looked like a top5 was a realistic goal (especially since the champ leader Alan Holm wasn't around) but it proved to be a mad struggle. Qualifying went okay. We only got a lap or so of dry running before it started raining :) Oh my word...RAIN IS AWESOME!!! The car has no grip at all....so freakn cooool!! :D It's just so easy to lose the car on the brakes...you try and apply a little more than a feather's pressure on the brake pedal, and its a lockup and aquaplaning for a few seconds!! Crazy...oh the car doesnt turn either, and if you change down to 2nd gear you will probably spin the car. I wish qualifying had been wet from the start; my laptimes in the rain seemed decent enough to be challenge the front pack. I was sitting 5th in those dry laps. The 1st race went okay, considering the amount of time I was losing down the straights. I was getting so frustrated everytime I came out the last corner...I would be right on someone's tail, and after the pit straight I wouldn't even be close enough for a hint of slipstream. It was awful. I drove through that depressing feeling, lined Trevor Bland up for an overtake on the last lap (since I knew my engine wasn't up for defending) and managed to nail him on the last corner of the last lap. But then he just drove clean past me over the finish line. I was so angry. This engine is costing me laptime and positions, even after I do the hard work. The 2nd race started off well. Despite the lack of power, I was battling in the pack for 3rd position. I knew it would take some real devious and cunning arts to manage to beat that pack when their engines were so much more powerful...and Kyalami is just made up of superfast stuff. And then God decided to be funny about the situation and my accelerator stuck open. Great. This was only scary at first, since I found out it was stuck when I got to Sunset corner (turn4) which is taken almost flat out on the limit. This "almost flat out" corner means that you can't take it flat, which is what my car decided it was going to try to do hahaha...after I got through that alive, it was just annoying. 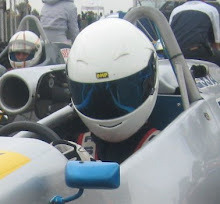 Controlling the car was hard, I didn't have the confidence to fight wheel-to-wheel with guys, was very dangerous. Braking and accelerating at the same time isn't very fast, and the mad revs everytime I pushed the clutch in to change gear was worrying for my engine...I should have really been able to adapt much quicker to the situation and probably maintained 5th position. The car was just unpredictable though, towards the end of the race the throttle seemed to behave itself at times, and other times not. Battling hard and heading out the last corner, I managed to miss 3rd gear somehow...and lost 6th position over the finish line. I was ready to drive off a cliff, I was so angry yet again, but my own pathetic newbie mistake!!! That is definitely not happening again. Things are looking okay, heading into Round 3 of 2008. I definitely still need a major sponsor, but hopefully now my new tyres give me a good chunk of pace back. To be honest, it surely cant perform miracles, but I need to really push now to get into the top5. Getting there is going to be really difficult, there are a lot of fast drivers. I'm currently sitting 7th in the championship close behind 2drivers, so I'd better get a move on! Looking forward to Kyalami though. Not thinking about it every second, I have so much other stuffs to do, but next week I'm sure I'll settle down and focus on doing a good job. Thanks to Pieter K and Symplexity for helping me out with a much needed new set of tyres for the next round at Kyalami, and additional help for the rest of the season. Their actions will really help motivate me to push on further, and the struggle to keep a dream going has been eased up a bit :) The search still continues for further aid! Thanks a million guys. Symplexity ftw. Article on FSR describing my real racing combined with simracing. And so it was that the 2nd round of the Pro Tour was to be a tale of tyres for me. It was pretty damn hot in Port Elizabeth. The Friday practice sessions really took it out of me, and my poor race fitness was showing as by the time we came to quali, I hardly had any energy left. The car handled poorly from the start. The track surface was incredibly abrasive, and I had a really difficult time keeping the slides to a minimum. There was no way to eliminate it or avoid it without being slow. I had to slide around every single corner basically to not be last. At least the brakes seemed to be behaving, so the broken chassis member was indeed the culprit! I experimented with car setup quite a bit to try get rid of the horrible corner entry understeer, and horrific corner exit oversteer. This was inbetween running around the town for parts and working really hard on my car...the clutch packed up twice and the starter motor once. Anyway, I eventually gave up on car setup near the end after visibly noticing the degredation of my rear tyres. I had found the best balance of the worst handling, there was no miracle fix. I was eventually fighting with drivers whom I never really see on track...luckily race day was a bit cooler than the practice day. I started from 9th, and the grip was crap. I battled the 1st race, and bumped 2 guys into a spin :/ I really felt bad. 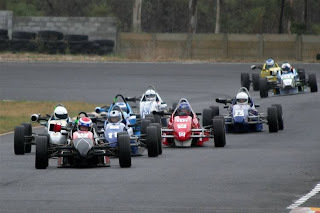 The 1st one was on Ben Pienaar, he just braked really early into the chicane, and there was no way I could stop in time. I had a great battle with Gareth Jackson, and after maintaining my slides around the outside of him for 2 corners (and thus the inside line for the next corner) he just turned in on me and I had nowhere to go...I clipped his back wheel and he spun as well. They're good friends of mine, but they didn't seem very happy after the race. Ended up 9th. The 2nd race was awesome. I was really having fun sliding the car everywhere, I was drifiting into corners, sliding around them, and then having power slides out of them. It was really an incredible experience, but I really did tame the beast. 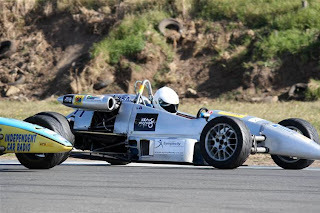 I had awesome fights with Courtney Steenveld and Ben, and some guys with new tyres started feeling the heat as their rear tyres also lost grip towards the end of the race. Some battles were like ballet, everyone just sliding in unison, it was so cool hehehe. I managed to control the car when others could not, and I ended up in 7th place after the race. That was really the best I could do, it was serious damage limitation. Well the next race is upon me, and I have not really prepared that much mentally for it. I have been extremely busy in life, and it looks like the next few months will be quite intense. Racing will have to take a back seat? Hope not. I phoned Dean, and chatted to him about my car. Seeing as I have no sponsors on board yet, even after some intensive searching, I will not have new tyres on my car. I am using the set that I purchased at the beginning of last season....the regulations have changed to a softer compound twice since then, so let's just say it's a disadvantage. Dean found my chassis was a bit broken on the right side...one of the members was sheared straight off. I have no idea how that happened, I hadn't crashed or anything....who knows if my violent brake shuddering was the result of that, or if it caused it! We'll see at PE. There were no issues with my front suspension, so it could be my front shocks as well. So basically I'm heading to PE with a car thats gonna shake the living crap outa me under braking yet again. I really hope I don't lose too much time for this again, I already lose too much with the tyres. Hey! I finally got a new rear shock, yay! That's one cool upgrade at least hehe. 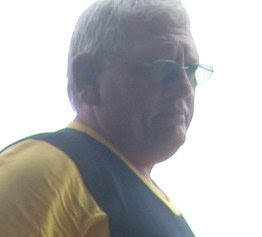 PE will be a new circuit for me. It looks pretty decent, and I've heard good things from other drivers. Looks like it may not need 2nd gear, wouldn't that be awesome hahaha....I sooo hate that gear. I'm pretty keen on the weekend, and see what I can do under the very difficult circumstances. I feel that I'm slowly getting mentally prepared, I should get it peaked by Friday! I really have to concentrate on learning the track and being on the limit within 3 x 15min practice sessions, amidst sorting out the brake issues and setting up my rear shock. It's going to be difficult but I really want to continue my top5 finishes.